An experienced field biologist. James has been interested in wildlife since he was a small child. This interest was fostered during his summers on Cape Cod chasing frogs and walking the seashore, with its diversity of fascinating lifeforms. James graduated with a Bachelors of Zoology from Oregon State University and later a Masters of Wildlife Biology from McGill University. Having conducted numerous field studies over 13 years in 6 countries, James has become a very skilled and versatile field biologist. James current interests focus on passerine migration in coastal areas and molt as it relates to survivorship and migration. He also is focused on conservation through public outreach, such as educational demos, social media and volunteer engagement and citizen science. 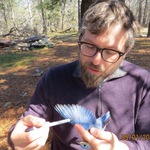 Along with the Monomoy banding station, he currently runs a second station at MassAudubon's Wellfleet Bay Wildlife Sanctuary. He is in the process of launching a collection MAPS banding stations in Uruguay that will focus on productivity, molt patterns and survivorship of resident grassland, forest and marsh species, as well as local outreach. The long-term goal for these stations is to connect researchers from both countries and provide opportunities for collaborative research with Uruguayan biologists and conservationists.